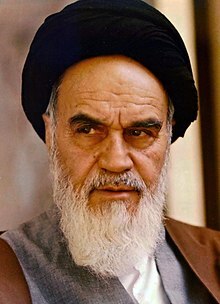 Ayatollah Khomeini was born Sayyed Ruhollah Mustafavi Khomeini, 24 September 1902 in Khomein, Central Iran (then Persia), and died 3 June 1989) (Persian: روح الله موسوی خمینی). He was also known as 'Imam Khomeini'. Khomein was the political leader of the Islamic Revolution in 1979. Khomeini was also a poet. His poems are collected together in an Imam Divan. Khomeini died of intestinal cancer and a heart attack on June 3, 1989, in Tehran at the age of 87. On June 5, 1964, Khomeini was arrested and sent into exile. He was exiled to Iraq, Turkey and then to France. Khomeini gave many speeches in France against Mohammad Reza Pahlavi, the last Shah of Iran. On January 16, 1979, Pahlavi left Iran. Two weeks later, on February 1, Khomeini returned to Iran. He received a traditional religious education in Qom (city in Iran). When he lived in Najaf (a holy city in Iraq) for some years, he spoke about Islam ideas about Government. During that time, he refined his theory of velayat-e faqih ("government of the jurist"). On February 11, 1979, Khomeini appointed his first own prime minister, Medhi Bazargan. On March 30, 1979 a referendum took place in Iran and as a result, the monarchy was replaced with an Islamic Republic. After the Islamic Revolution, Khomeini became Supreme Leader of Iran. In early 1989 Khomeini issued a fatwā calling for Muslims to kill Salman Rushdie and "all those involved in the publication" of his book called The Satanic Verses. Rushdie has never been killed. However the Japanese translator of the book was stabbed to death in 1991. ↑ 1.0 1.1 1.2 1.3 1.4 "BBC - History - Ayatollah Khomeini (1900-1989)". www.bbc.co.uk. Retrieved 2009-05-24. ↑ An Imam is a spiritual leader who is respected, and an Ayatollah Sayyed is someone who holds both a political and religious position of power. ↑ "Death of Ayatollah Khomeini — Appointment of President Khamenei as Khomeini's successor — Visit to Soviet Union by Rafsanjani". Keesing's Record of World Events, Volume 35, June, 1989 Iran, Page 36724. Keesing's World News Archive. Retrieved 2009-05-29. ↑ "Answers - The Most Trusted Place for Answering Life's Questions". Answers.com. ↑ "1989: Ayatollah sentences author to death". 14 February 1989 – via news.bbc.co.uk.